As surgical procedures continue to advance in obstetrics and gynecology, robotic surgery is becoming more prominent in the field. This type of surgical technique is highly accurate and minimally invasive, offering less pain and a quicker recovery for patients. Gynecologists and other specialists may recommend robotic surgery to treat certain conditions, especially the four listed below. What Conditions Benefit From Robotic Surgery? Endometriosis is a gynecological condition in which the inner lining of the uterus grows on the outside, causing painful menstruation and heavy bleeding. To treat this condition, surgeons can use robotic-assisted procedures to remove the excess tissue. This type of surgery can be more effective than traditional surgery, because it can better distinguish abnormal tissue from normal tissue. have shown that robotic technology can make surgery more precise when removing tumors. Specifically, this technology has the advanced dexterity for removing tissue and allows surgeons to clearly view the surgical site. This technique is popular for removing the prostate, as well as removing tumors in patients with uterine, lung, and colon cancer. Fibroids are a common type of tumor that grows inside the uterus. They are generally benign and vary in size, possibly growing as large as a grapefruit. If a gynecologist decides to remove a fibroid, they may do so with a robotic-assisted myomectomy. This procedure is minimally invasive, leaving the patient with just a small incision on the lower abdomen. Robotic-assisted surgery often leads to shorter recovery times and a lower risk of complications. 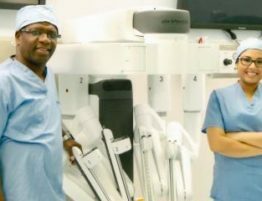 While hernia surgery was once an invasive and painful surgery, robotic surgery has transformed this procedure, as it makes a small incision in the affected area, including the groin, belly button, former incisions, and upper abdomen. While a surgeon would cut through muscle and tissue to repair a hernia during open surgery, robotic surgery is much less invasive and helps the surgeon be more precise to yield better results.